This report from the press conference is brief, as it is typed in from a modem on the Newark Airport. As soon as I'm home with my proper 20" UNIX box, I will brush up this and give you all the other details. But, all of the iofficial tour dates are in here anyway, don't worry! The press conference were held under the Brooklyn Bridge, on the Brooklyn side. About 200-300 press people mostly from America, but also some from Europe, Asia and Sout America, were waiting impatiently for the Stones to arrive. They were supposed to be on at 1:10 pm. At 1:15, the large video screen on site picked up filming off a helicopter circling above the Brooklyn Bridge. 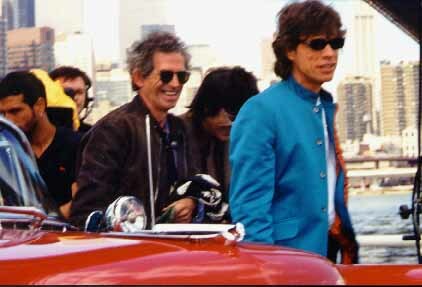 Driving on the bridge, coming from downtown Manhattan, were Mick Jagger himself, in a red 1955 Cadillac convertible. It had rained all morning, but luckily, the sum was just coming in to do the event perfect. Driving with Mr. Jagger in the front seat was Mr. Richards. Throwing away his cigarette, smiling and laughing as always. Does he ever have a sad moment? And in the back seat, Ronnie and Charlie. Five minutes later the car drives up to my feet, I mean, I was "lucky" to grab a 1st row seat at the press conference, but never in my life I had been dreaming about Mick Jagger parking his car about 6 feet away from me! The boys is leaving the car, and moves on to the smaall stage put up for questions and interviews. Mick is handsomely dressed as usual, purple jacket. Charlie is dressed up in blue suit and tie as usual. Keith with his scull scarf, and Ronnie with his jeans outfit. All seems to be happy, really eager to get on with it. Charlie is the only one not having a microphone. The press conference is over in 15 minutes. If you like, I can write it all up, give you all the impressions on Mick's face, and all the weired moved Charlie did (about 2 - 3), but I guess you all saw it on TV. It will be in IORR 29, with some great close up photos, of course. Then the Stones left, and each of the other major players had their own sessons. The Sprint Manager talked about why they sponsored the tour. Then Virgin told the album wasn't cut until this very day, i.e. Aug. 18, and that the release date would be Sept. 30. There will be 3 - yes three - Keith tracks on the album - that's what Virgin said! The Tour Organizer Michael Cohl from TNA finished off with telling about the tour and the dates. That's for the official list. Don't worry about MSG. It will be there; once the NJ shows are gone, I guess. And it seems they are planning some great stuff for San Francisco in November. Are there any MSG type arena in SF??? Please tell, anybody! For more news see IORR 29 mailed out during the week of Aug. 25, 1997! See the great IORR photos from the press conference! Also, see the Mediadome pages, with more info, photos and even video! You may also see some videos etc. from the press conference on the Wall of Sound pages.